There is nothing quite like the sight of an English woodland full of Bluebells. So beautiful it takes your breath away. I recommend them only for large gardens. If you are happy to allow them to naturalise then they will grow well under any deciduous trees, especially Oak and Beech. 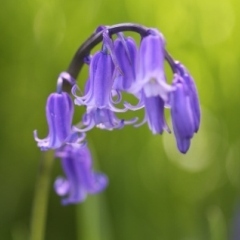 What’s the difference between English Bluebells and Spanish Bluebells? • The English Bluebell is deep blue. • Flowers are narrow, bell shaped and strongly recurved. • All the flowers are on the same side of the stalk. • When the flowers are open the stalk curves downwards giving the Bluebells their characteristic nodding appearance. • They have creamy white pollen. • English bluebells have a strong honey like scent. • Spanish/Hybrid Bluebells are light blue or pink. • Flowers are wide and bell shaped curling back only slightly. • Flowers are produced all around the stalk. • When the flowers are open the stalk stays erect. • They have blue or pale green pollen. • Spanish bluebells have little or no scent. In my own garden there is a mix of English and Spanish Bluebells. From what we know about the area there was a wood here long ago. I’ve inspected them closely and I believe that some of our bluebells are British natives. But many of them are hybrids and it’s too late for me to do anything about that now. We know that the previous owner planted Spanish Bluebells because she liked the pink ones. They are lovely but must be kept in a garden situation… NOT planted in the wild because they easily cross with our natives.